I feel like this is going to be a really great year. There are so many movies coming out that I want to see - tons of Marvel superhero movies, new series, travel, tons of awesome stuff. 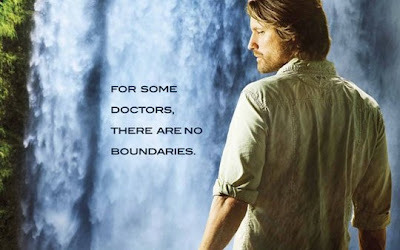 I just started watching a new series, Off the Map, which stars the love of my life, Bride and Prejudice's Martin Henderson - mi corazón. I have no idea if the plot will hold, but I will be a huge fan regardless. The story centers around a podunk clinic out in the middle of nowhere we know - I don't think - kind of Central America looking, actually. There are a handful of young American doctors who want a new start so they head out to God forsaken territory. What we're hoping for is lots of drama and story that is not related to anything medical, promiscuity - tons of it, all the doctors doing everyone, interesting adventures and medical cases - and last but not least, to see Dr. Keeton every single week. I am really looking forward to Thor and Captain America. When both of the actors materialized on stage at the Golden Globes I almost went into cardiac arrest. Jesús Luz, I didn't know where to look. Both movies promise to be more than fantastic, so I'm counting the days. Top Chef: All Stars is awesome! I love this season. It's the best of the best in one tremendous challenge after another. I love it! Picnic season is upon us and if you know anything about me you know I love to picnic. I only hope the rain stays away this weekend so we can have our first picnic of the year. My brother and sister are getting married to their respective finacées this year. For the longest time I was the only one married in my family, so this is very exciting news, indeed. My Kindle arrived and I'll tell you what, it was love at first sight. When I held that tiny gadget in my hands and turned it on for the first time, I couldn't help but marvel at the beauty of life. I looked at that little reflection of me and it just made it all worth it. All the months of waiting, the weight gain, the sleepless nights, the expense, none of it mattered anymore because here I had the most beautiful reflection of my husband's love for me - the Kindle. Rested and Ready to Go!